On January 10, 1973 Constable Lothian spotted a fast moving vehicle running a red light. Giving chase, he caught up to the vehicle on Amelia Street when it ran into the rear of another vehicle. Lothian jumped from his cruiser. He was met by David Brian (Duke) Holmes, a crazed drug addict, who shot and fatally wounded the officer. 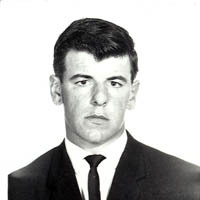 Seven hours after the shooting of the police officer, Holmes attempted to kill himself with a bullet through his skull. His buddy, Walter Eugene McVicar, 25, an occupant of the car chased by Lothian, is believed to have finished the job by firing two further shots into Holmes' head before turning the gun on himself. Constable Lothian was awarded the Metropolitan Toronto Medal of Honour, posthumously.